The Type I portion of this system produces 18.2 megohm-cm ultrapure, reagent grade water that is free of Pyrogen, Endotoxin, RNase and DNase at a flow rate of 2-Liters/minute. 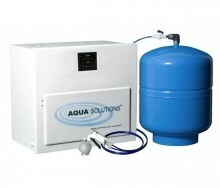 It includes a built-in Ultrafilter and features continuous recirculation to maintain maximum water purity. Therefore, ultrapure water is instantly available on demand up to 7 feet from the system via the included hand held remote dispenser. A built-in UV Sterilizer prevents the growth of microorganisms within the system and alerts the user when it is time to change the UV lamp. The digital Conductivity/Resistivity monitor displays the water quality and a Green LED indicates that the water quality is above the acceptable purity. When the water quality drops below the desired purity, a Red LED alerts the user that it is time to replace the filters. The system has a 2-year warranty in most countriesis and is proudly made in the USA. This compact, combination Reverse Osmosis plus Type I DI System is for operation on virtually any quality tap water that contains less than 1,000 PPM of total dissolved solids. Storage Capacity 42-Liter Pressurized Storage Tank (Included) Part # RODI2-042: 15 1/2" (394mm) dia. x 24" (610mm) Upgrades are available. I would like to request a quote for Type I RO+DI Systems for Biological Applications.